You really can’t hide behind the excuse of "data corruption", "accidental deletion", or "stolen hardware" these days. Your digital data is valuable. If you don’t have a backup plan in place, what are you waiting for? The cost of physical hardrives have dropped significantly over the past year. So much so that you should have some type of basic backup plan running in the background every day. Hardrives aren’t fail proof though. Everyone will experience a faulty drive some time in their life. If your livelihood revolves around your computer data, your [redundant] physical backups should be supplemented with off-site backups hosted securely online. Prior to receiving notice of the latest offering from Backblaze, my online backup routine consisted of a small desktop utility called JungleDisk + Amazon S3. The duo performed as expected with my monthly bill in the neighborhood of $11 per month ($2 / mo. 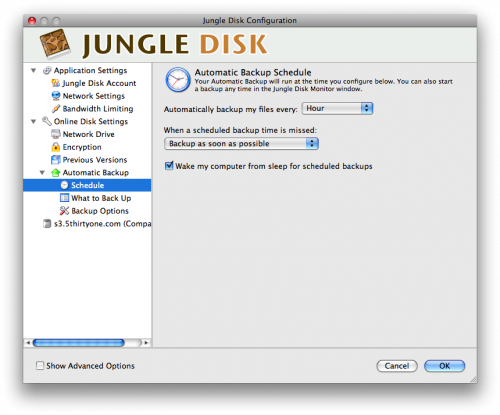 for JungleDisk + ~$14 / mo. for S3 hosting). File management was done through a system folder with the added convenience of a web based UI for an extra $1 per month (JungleDisk Plus). Why the change to Backblaze? With JungleDisk + Amazon S3, the monthly cost for storing important data could increase over time as my usage requirements changed. With Backblaze, each computer is a flat $5 per month for unlimited automatic secure online backups. Web restore via the desktop client or web browser. Archives will be queued up, zipped, and an email notification sent out when the download is ready. 4.2GB physical media DVD copies burned and shipped to you via Fedex. 500GB physical media Western Digital USB hardrive. Data is moved to a external drive and shipped to you via Fedex. Although it is much more convenient to have immediate access to file backups, it’s reassuring to have data retrieval options. There are small handful of online subscription services that I believe are worth paying for, and Backblaze has been added to the list. 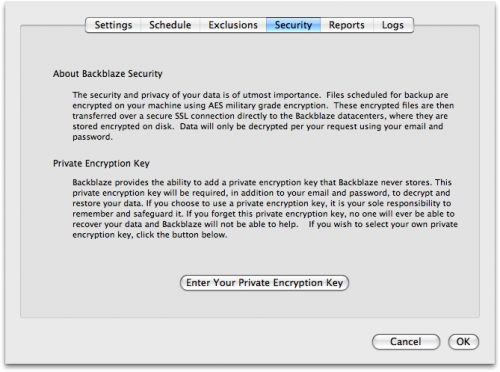 Similar to Apple’s Time Machine backups, Backblaze is constantly running in the background – accessible via the menu bar (OS X), or the task tray (Windows). You specify the folders to backup, create ignore rules, and control the bandwidth allotted for background data transfer. Screenshots below are of the OS X client but similar functionality / settings are found in the Windows client as well. Backblaze settings status view of my initial backup progress initiated after installation. You have the option of expanding on the default ignore rules initially setup out of the box. Note that Backblaze will backup any external drives you have connected via USB or Firewire (so make sure your exclusion rules are correct). Backblaze offers its customers secure peace of mind when it comes to backing up data. The desktop utility encrypts data locally before transmitting (via a secure connection) where it is stored encrypted. Privacy nuts even have the option of providing their own private key. Included with the Backblaze subscription is access to a web based file manager accessible from anywhere with an internet browser. Need access to an old backup while you’re at a friends house? Visit your Backblaze user account to initiate a folder or file restore and wait for the email notification letting you know the download is ready. With constant backups, it’s easy to make multiple changes to files over the course of a week and have those changes updated in Backblaze. Fortunately, the service allows you to look at up to 4 weeks of file revisions. File restores are initiated through the web interface. You select your restore method, select the folders or files that you wish to restore, and confirm your selection. Backblaze maintains a history of your restores up to 7 days after the request is submitted. I have been burned too many times in the past due to accident, file management carelessness, or hardware failure. Backblaze is the off site supplement to my redundant backups at home, the office, or on the road. Background backups on my home network with a Lacie drive connected to an Airport Extreme managed with Time Machine. Manual full disk clones with SuperDuper to multiple Western Digital Passports. Previously discussed: Practice safe computing, use a clone. Psuedo-backups with Dropbox – geared more for file sharing and quick syncing. 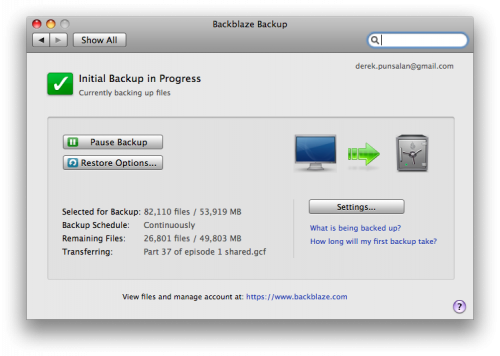 Background backups with Backblaze for important files, photographs, and documents. If have yet to establish a regular backup routine, or are simply looking for a little more peace of mind with secure online backups, I highly recommend trying Backblaze. $5 per month for unlimited backups + multiple file restore options is hard to pass up. To sweeten the unlimited backups deal, Backblaze will pick 25 random [new users] who sign up today and offer unlimited backups for an entire year for free.